News update: I want to thank everyone so much for a successful Kickstarter! Volume 2 is funded, and right now I’m working like heck getting it ready for the printer. OMG there is so much going on here! Coco’s new hat! Gretchen’s ears! Has Coco Found Her People?? who will watch the lizard??? I wanted more of that sweet sweet elk, but not like this! NOT LIKE THISSSS! OH MY GOSH. I just read all of this last night and today, and I’m floored at just how much I adore this. Everything about it – from the characters, to the story, your style, palette choice, your phenonemal typography/word art, everyone’s fashion sense … the beautiful layered humor and sweetness and twinges of dark – it’s all so balanced between over the top and kitschy with subtle realism … I could gush forever, I’ve adored every moment of this through and through. THANK YOU! Thank you SO MUCH!!! I am SO late replying to this, but: thank you so much! This comment really made my day, and I’m so glad you like the comic. Nooooooo! coco!!!!!!!! also second to last panel, honey’s expression! ME! Hi! I heard about your comic last week and just finished reading it. I really love the world and these characters! So, I missed the Kickstarter. Are you going to sell the PDFs to non-backers in the future? Yes, definitely – but I’m going to finish sending out all the Kickstarter rewards before opening up the regular shops for either PDFs or physical books again, and that will probably be in the summer. Thanks! Holy cow, everything was so intense. I binge-read the whole series while listening to Heads will roll by The yeah yeah yeahs on repeat and now I can’t dissociate the song and the comic every time I listen to it. In my head, it plays somewhere in the background when Honey and Turps are talking in a bar. Anyways, sorry about the ramble. This comic is everything I was looking for when I was orphaned of my favorite webcomics that featured lady-loving ladies – and more! The retro atmosphere, the side stories with the characters, the tension between the leads…all beautifully adorned with old timey expressions handwritten in lovely calligraphy. This comic is one of the things I always look foward to read, and I’ve been there for at least two years, coming relogiously to see any new updates. Thank you for giving us the pleasure of reading such a delightful and artsy comic! Aw, thank you – and heck, that’s a pretty good song choice for binge reading the comic! AAAAAAAAA I finished this in 2 days (loved every second of it) and now I’m gonna be in withdrawal, also where can I buy the volumes? I’d tell Turpentine she’d be free to steal my heart, but I think she already has it somewhere. It’s cold. And why does it feel like someone is kicking it? Cant wait for the new panel, hope it comes soon! 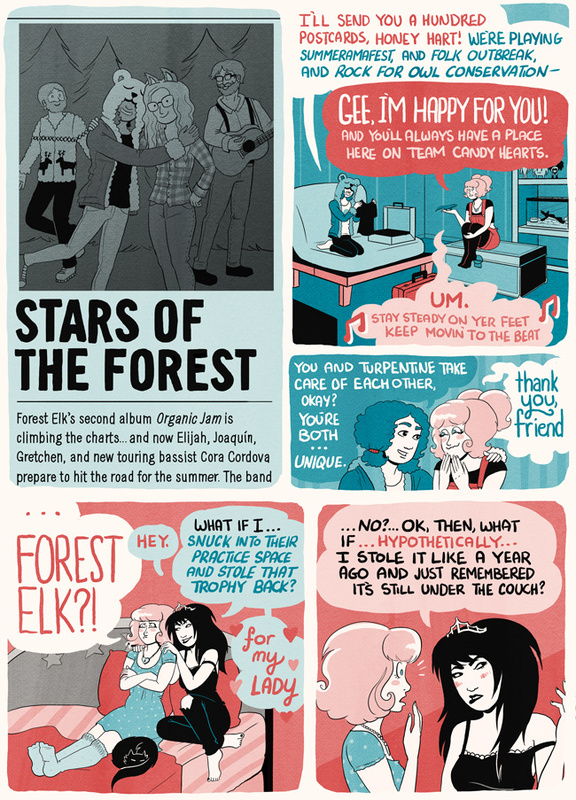 I just finished catching up with this comic after discovering it at VanCAF! It was wonderful to meet you, and I’m excited for more adventures with Honey, Turpentine and the rest of these great characters! I do also sometimes try a little game development, too. I’d love to help program something that uses some of those great BvB pixel sprites if it hasn’t been made yet. I just got my book and it looks good. (Also, again, she looks super cute without her hat!! I’m delighted every time you draw her that way).